The Overland Telegraph Line - construction strategy for the northern section. from Port Darwin south to the Roper River. This line was contracted to Messrs. Darwent & Dalwood. Mr. Patterson was in charge of the southern end which extended from the north end of Mr. Harvey's work, lat. 18° 26' (about 533 miles south of Port Darwin) to the King and the Roper Rivers. 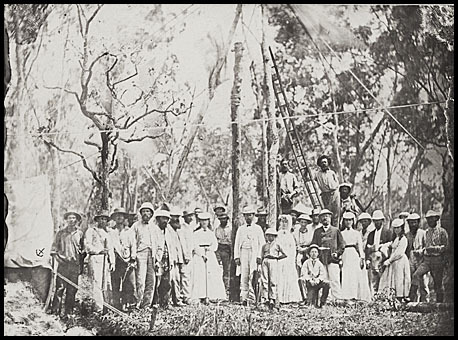 The construction of the Northern section commenced on 15 September 1870 when the first telegraph pole was planted at Darwin by Miss Douglas (the third daughter of the Government Resident). After the planting, three cheers were given for the Queen, three more for the Governor and his seven daughters and three for themselves. The Official Party after the planting of the first pole. Miss Douglas is standing in front of the pole which has a ladder leaning against it. Source: State Library of Victoria H141648 SLV 0_2706549. Source: State Library of Victoria H141684. One of the key construction aspects of the Northern Section was the Roper River. It flowed east to west from the Gulf of Carpentaria and met the Elsey and the King. In his 1862 expedition, John McDouall Stuart left Frew's Ponds and headed north to Daly Waters (which he named after the incoming Governor of SA) and then trecked north-east where he came across a north-flowing stream which he named Strangways Springs. He followed that stream down to its junction with the significant Roper River. At that point he had reached the same area as had Gregory in 1856 exploring from the north. 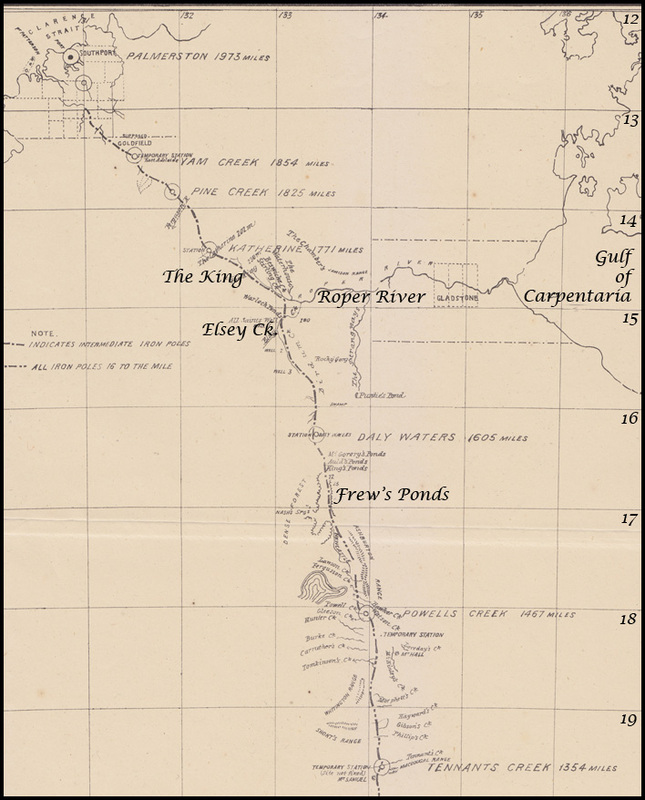 Stuart then pushed upstream along the Roper rather than try to reach the Gulf of Carpentaria which both the Burke & Wills expedition and the John McKinlay expeditions had done. He named various places along the way until he found "a valley of the finest description" which he named Katherine. Finally, on 24th July 1862 he reached the Indian Ocean at a place he named Chambers Bay - about 20 miles east of the Adelaide River. Later, Todd and his overseers used this information to bring large ships carrying supplies into the Roper River and along to near the Elsey from where they could access the construction sites to the north and south. The northerly part of this section was constructed under a contract with Messrs. Darwent & Dalwood from Port Darwin to the King - a distance of about 225 miles. Activity for this section really commenced when Darwent & Dalwood left Port Augusta on 20 August 1870 aboard the S. S. Omeo bound for Port Darwin. They took with then wire and insulators, wagons, drays, bullocks, 28 horses, forage, supplies, food with 80 men (to be paid 4s 6d per day). Very soon after arrival at Port Darwin, the first telegraph pole was sunk. This being the oldest piece of line (commenced in September, 1870) Todd was more anxious about it, especially as it was in a disabled state during a greater part of the wet season. 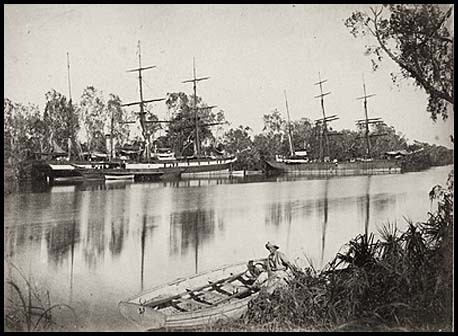 In 1872, Todd had it thoroughly overhauled, every bad pole taken out and, between Port Darwin and the Katherine, iron pins have been substituted for the ironbark pins, which, although soaked in boiling petroleum, were found to attract the white ants and the boring beetle. The result, after examination, is that out of 222 miles of line it has been necessary, up to the present date, to replace about 150 poles, destroyed by bush fires, white ants and dry rot, which I think is sufficient to show that the line was faithfully built. I feel it only due to the overseers of the work, Messrs. W. McMinn and R. G. Burton, to say that I am perfectly satisfied that they efficiently protected the interests of the Government and were faithful to their trust; whilst the fact that, since the opening of the line in August last, there has not been a single interruption between the Charlotte Waters and Port Darwin, a distance of nearly 1,200 miles, although we have had frequent and severe thunderstorms, raging over many hundreds of miles, and a cyclone which blew down several thousand trees on the line, should be sufficient to remove all anxiety for the future and to prove that the line is strong and has been constructed in a proper manner. At the end of October 1870, Surveyor McLachlan was sent in the Schooner Gulnare to survey the entrance and channel of the Roper River. He concluded it could accommodate heavily laden ships like the Omeo for at least 100 miles inland. It was therefore the alternative, using Stuart's original path, to off load provisions to serve the working parties to the north and south of the Elsey. 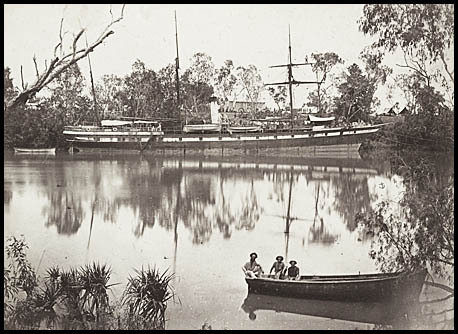 Unfortunately McLachlan sailed to Normanton in Queensland and was delayed there for five months - thus withholding information which was vital to the completion of the line. The Omeo (left) and the Bengal (right) with the 60 ton Young Australian tug in front of the Omeo. The Schooner Tararua in the Roper River. Source: State Library of Victoria H141569. 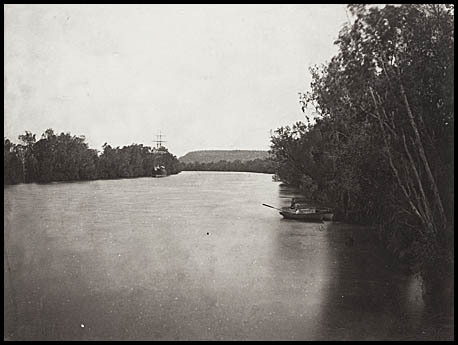 By the time of McLachlan's return in March 1871, supplies sent from Adelaide aboard the Tararua had reached Darwin but they had to remain there as it was the middle of the wet season. By the end of January, the Katherine River was in full flood and sinking poles to the required 4 feet was virtually impossible. The food perished, there was no supply of wire or insulators and the men (naturally) were becoming agitated. On 7 March 1871, 56 men declared a strike (the first in the Northern Territory) because it had been weeks since they had tea, sugar, soap, salt, tobacco or grog. The next day, 11 continued to refuse duty and demanded they be sent back to Adelaide. When Overseer McMinn found on his arrival soon after, work was at a standstill. He gave a warning to the contractors before proceeding to Strangways. Before his return, the men completed the poling to the 225 mile mark and then returned to the Katherine. McMinn cancelled Darwent & Dalwood's contract on 3 May 1871 while he was at the Katherine. He did not accept any excuse about the "wet" being almost ended or that good progress had been made previously or in his absence. He decided that the Government would complete the line. With eight months of the contract with the BAT remaining, McMinn sailed on the Gulnare to Adelaide. When McMinn arrived at Adelaide, Todd was then at Strangeways Springs and received the news by telegraph as the line was open to that point. The implications of the breach of contract are described elsewhere. Commencing at the north end, the line, after crossing the King, took a general S.E. course, crossing the Elsey Creek at 281 miles, and thence followed the Birdum to the Daly Waters (where a station was built), 368 miles from Port Darwin. The line then took a more southerly course, passing to the east of King's and Frew's Ironstone Ponds, across Sturt's Plain to the north end of the Ashburton Range. Passing between the range and the Newcastle Waters, the line entered the range at the Watson, crossing Powell's Creek, where it passed over to the east side of the range. With the exception of about 35 miles of line south of the Elsey, and a few miles north, where the poles are small, a better line could not have been erected. The first 17 miles south of the King, cypress pine (callitris), which the white ants do not appear to touch, were used throughout and from 50 miles north of the Daly Waters, and for a long distance south, we had splendid poles—blood wood, gum and ironbark—the majority of them much over the specified size. From the Newcastle Waters southward, timber, which to the northwards was generally thick, involving heavy clearing, becomes scarce, the trees being too stunted but, by dint of searching, fair average-sized poles were found. The white ants were numerous, especially north of the Lawson, and most of the timber was stunted and piped, but with care, good sound poles could always be picked out. Between the Daly Waters and the Elsey Creek, it was supposed there was no water after the middle of the dry season, but the discovery of a fine waterhole a few days since, at the very end of a long dry season, has removed one great difficulty, and it will probably be necessary to sink only one well between the waterhole and Elsie Creek. Even as it is, the newly-discovered waterhole will make the whole of this piece of line easily accessible for repairing purposes at all seasons. South of the Daly Waters, Todd did not anticipate any future difficulty, as heavy repairs would always be made during the most favourable season of the year and the discovery of the fine springs, called the Renner Springs, about 18 miles south by the line of Powell's Creek, made the road quite safe as regards water at all times. In a country so abounding with white ants as the Northern Territory, it is not pretended that wooden poles will last as long as elsewhere. Had I thought so, I certainly should not have advised the Government to order 6,000 iron poles in addition to the 509 previously sent to the Northern Territory (now at Southport) and the 2,500 on the southern portions of the line. With regard then to the state of the line generally, I can faithfully and honestly assure the Government that it has been substantially built throughout and that, with very few and unimportant exceptions, I have every reason to believe, from the reports of my officers as well as from my own personal observation, that the poles are sound and of the full size specified. As explained in my letter of 2 December, my principal reason for ordering the iron poles now was that they could be more expeditiously and economically carted now while we have a large number of acclimatized teams, both horses and bullocks, in the Territory than we could do at any future period. Besides which I think it desirable to have the iron poles on the ground to take the place of the wooden ones as they decay to the extent it is intended to use them. My present idea is that we should gradually introduce iron poles, planting them alternately with wood where suitable timber is plentiful and near at hand, and consecutively where timber is inferior and difficult to get. In the Northern Territory, it will probably be found desirable to have iron and wood alternately from Port Darwin or Southport to the Newcastle Waters, unless experience should show that the pine, bloodwood, paper bark and ironbark poles escape the ravages of the white ants. From south of the Newcastle to the MacDonnell Ranges, it may be well to look forward to repoling with iron throughout. From the MacDonnell Ranges to some distance south of the Charlotte Waters, timber is easily procurable and, at most, alternate iron poles will be sufficient. From here to Leigh's Creek, we have nearly 2,500 iron poles in already and, as the wooden poles decay, we shall do well to substitute iron. Having 9,000 iron poles, either on the ground or provided for, it will be obvious that we shall only require to introduce the remainder gradually, spreading the expense over a series of years. Main Page for the Overland Telegraph. Construction of the Central Section. Construction of the Southern Section.